Faculty leadership may not be as strongly felt in competency-based education (CBE) programs as it ought to be. Only 15 percent of CBE faculty and staff members are tenured or on the tenure track and only about one in five (19 percent) participate in shared governance activities. What this suggests is that CBE programs don't have the kind of independent faculty oversight common to more traditional instructional formats. These results come out of a recent survey done by the Competency-Based Education Network (C-BEN) among its membership, a group of schools that offer competency-based programs. (Competency-based education assesses learning based on a student demonstrating mastery of a given concept or skill rather than on the amount of time he or she has spent in the classroom.) The purpose of the survey was to figure out what the roles and responsibilities were among the faculty and staff specifically involved in developing and delivering CBE curriculum in higher education. The survey pulled results from 143 people at 32 institutions, all of which are members of the network. A report sharing the survey results was written primarily by Michelle Navarre Cleary, associate dean of Curriculum, Instruction and Assessment at DePaul University's School for New Learning. Respondents told the researchers that directors of their CBE programs generally hold advanced degrees. More than half of those positions — 56 percent — require a master's degree; another 29 percent stipulate a doctorate. But the curriculum-oriented duties performed by faculty and staff vary widely from school to school. Responsibilities tend to fall into four categories: curriculum, which tends to take up about 41 percent of a the person's time; instruction, which consumes about 34 percent of the day; assessment, which takes up about 26 percent of the schedule; and coaching/advising/mentoring, which takes about 29 percent of the time. Those numbers total 130 percent, which the survey report's authors suggested indicate the broadness of the estimates provided by respondents. The institutions differed wildly in how they performed mentoring and advising functions. The survey found that there were only two functions performed by at least three-quarters of the schools: explaining the CBE program and how it's similar and different from what students are used to; and motivating students. As the survey report noted, "Arguably, these functions point to two major challenges for CBE programs: attracting and retaining students." How people spend their time is a source of frustration for survey participants. In their responses to an open-ended query, a sizable number told the researchers that if they could change anything about their positions, it would be to "clarify roles and responsibilities." They would also put more effort into improving quality by focusing on improving curriculum, assessment and delivery design and improving the student experience. Finally, they'd increase support for CBE faculty and administrators. "These results provide a snapshot of CBE faculty and staff roles and responsibilities at a time of significant experimentation in how such programs are being developed and delivered," the report concluded." All are adapting to new conditions in today's rapidly changing higher education landscape. As programs continue to innovate, they will continue to reconfigure faculty and staff roles and responsibilities." 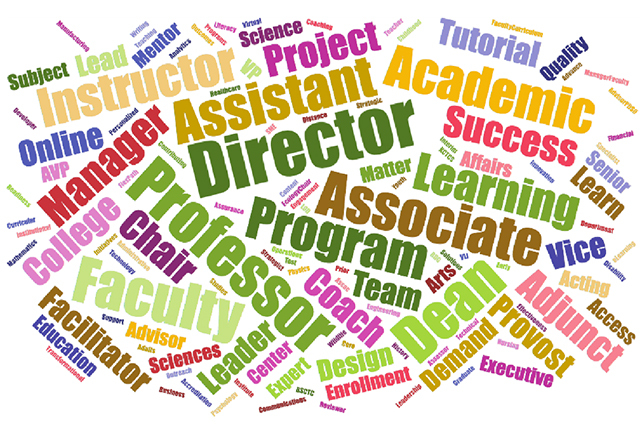 "Faculty and Staff Roles and Responsibilities in the Design and Delivery of Competency-based Programs: A C-BEN Snapshot" is publicly available through the C-BEN Web site.